Dan Strange showed his incredible ability again by taking eight wickets inside 11 overs to bowl Seaford out for 64. Going into the last five games of the season, Hill know the need to win at least four of them to stand a chance of promotion and these run of games couldn’t have started any better. Hill lost the toss for the second week running, but this time they were in the field on a hot day down on the coast. It was the ever present Dan Strange and Joe Maskell opening the bowling for Burgess Hill, both using the wind and swinging the ball to their advantage. First ball of the game there a big shout for LBW but the decision was it was just sliding down the leg side. It didn’t take long for Strange to get into his stride. Only his second he was in the wickets, one that kept a little low had Ben Brown struck infront of all three stumps. The big wicket of Ollie Smith came in Strange’s fourth over and his had another LBW to his name, and it didn’t take long for his third as Sussex u17 Oli Carter only last three balls as he edge behind to Luke Vick. Seaford had slipped to 22-3 but the dangerous Chris Stanyard was still there. Adam Kneller soon followed before Stanyard (22) chased the worst ball of the game, short and wide but he managed an under edge for Vick to take his second catch. It was now 43-5 and it only got worse. William Lucas only lasted one ball as Strange bowled a perfect in-swinging yorker to get his third LBW of the game and his sixth five-wicket haul of the season. He then had the dangerous Mark Sapwell caught behind for one. 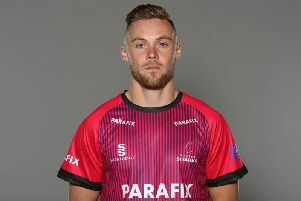 44-7 became 53-8 as Strange had his seventh wicket of the match, again another edge from Callum Scott was caught by Vick. Zak Hearsey came in with intent, he wanted to score quick runs, he hit Strange for a four and then Maskell for six over his head. He was the only player to join Stanyard was scoring double figures, but he next out with the score on 63 as Maskell got his revenge by sending his leg stump cartwheeling this time for 16. Strange wrapped up the innings in the next over as he trapped Stuart Pulford LBW. Seaford ended 64 all out after 20.5 overs. Maskell finished finished with 2-30 but the plaudits went to Strange as he took 8-25. With only 65 needed and 20 overs bowled, tea was on hold as Hill went straight back out to bat. Ben Hopkins was promoted back to the top of the orderand he and Tom Trowbridge gave Hill a fast start. Trowbridge was the first to fall after edging one to first slip for 14. Kevin Ramsey joined Hopkins and the score after five overs was 44-1. With just six runs needed Hopkins went for the glory, but unfortunately he was caught at mid off. Ian Simpson came in and carried on his good form with a glorious drive for four. With just three required Ramsey nudged a quick single before Simpson hit the winnings run through cover as Hill won by 8 wickets. The game was over after 8.3 overs which meant there was less than 30 overs bowled in whole game. 30 points for Hill meant they still sit second but are on a good run of form to keep the promotion charge going. Strange’s eight wickets leaving him on 48 for the season which makes him the leading wicket taking in the county so far. His 48 wickets come at a strike rate of 15 and average of 9.33 which is remarkable for the amount of wickets he has taken. Hill welcome Hastings 2nd XI next week as they try and make it three wins from three.